As a wee extra this Sunday, Dougie brought over a bottle Bushmills Whiskey, so began another tasting. Well Dougie you did it again you brought something along that none of us was expecting, but it is our duty to go and sample and report. Jim has been to this distillery many, many years ago and has fond memories, a good shop and a pleasant place to spend a couple of hours walking around the distillery and local area. If Jim’s memory serves him right, Jacqueline bought him a bottle of Blackbush on that visit. Coming up soon will be a more in depth report on this distillery as the Whisky Boys are going over to Ireland and part of the trip will include a visit to Bushmills and hopefully some tasting and a purchase of a bottle or three. Nose…Sweet fruit and floral notes. Taste…Smooth with a fruity dryness, goes over so easily. Finish…Very pleasant with a touch of cinnamon. Nose…Sweet and fruity with a little tingle on the nose. 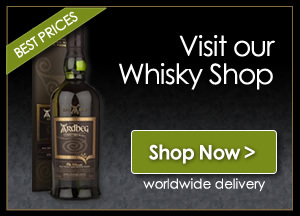 Taste…Smooth and a touch of apple and that distinctive taste of Irish Whiskey. Finish…Medium length, a dryness, but I feel that there is something missing, what? I don’t know. Nose…Fresh but with a slight medicinal hint. Taste…Quite sharp with wood and vanilla. Finish…Quite long but with a nip at the back of the throat. Well there goes another tasting, just like that. We fairly enjoyed this little Irish Malt but Dougie and Jim cant wait until mid March when they take a visit to Bushmills and hopefully get a tasting of most of the products and a wee tour around this very old distillery. Good hunting, please experience Irish Whiskey, assuming you have not in the past, you may enjoy the distinctive flavour that comes from a good Irish Malt. Remember to tell all, the Whisky Boys sent you. 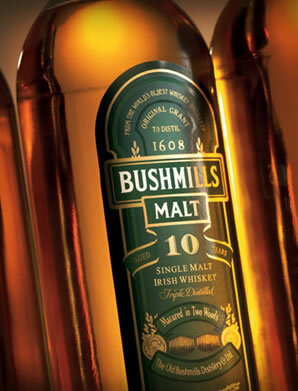 You may have to go to a good Whisky shop to find some of the range that Bushmills produce, the only Bushmills I see regularly in the supermarket is the Green Label 10 year old Malt.